Lalman discussed analyses by Pendell and coworkers published in 2015, in which they analyzed Kansas Farm Management Association data. The data had information from 79 operations with data from 2010 through 2014. In this data, the high profit 1/3 averaged $415 more net return per cow compared to low profit 1/3. When comparing high profitability to low profitability, 32.2% of the difference was due to gross income per cow. However, 67.8% of the difference between high profit and low profit operations was due to reduced expenses. Increasing weaning weight often leads to break even (due to management?). Weaning rates have not changed over time. In the northern US, we see high pregnancy rates above 95%. In the southern US, we see much lower pregnancy rates around 90%. The national average for weaning rates is around 85%. In most areas, we see no trend for weaning weight. In the Kansas data, we see a 1 pound increase per year in weaning weight. 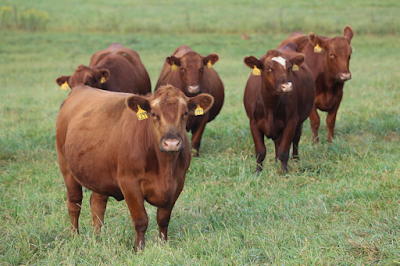 For purebred Angus, we see about 2 pound increase per year. Hay production (use?) per cow is increasing about 66 pounds per year. 1.1 lb/day increase in dry matter intake increases milk yield by 1 lb/day. But, this requires 27 additional pounds of feed per 1 pound of calf gain. Please see www.bifconference.com for more information about this presentation. First of all, I think we must be clear that this research does not mean EPDs don't work. It doesn't even insinuate that EPDs don't work. What it may mean is that the environment may be limiting the expression of an animal's full genetic potential. 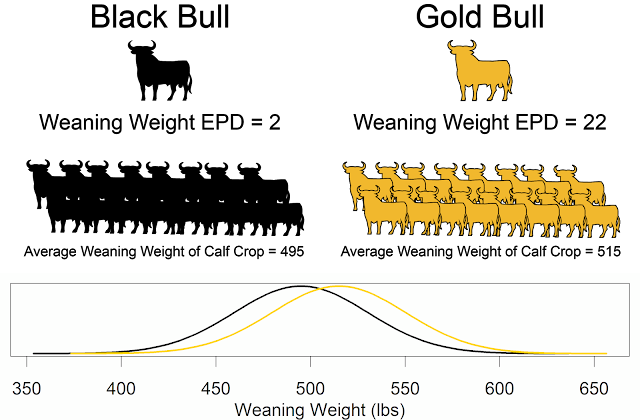 If that is true, emphasis on selecting for increased weaning weight should be decreased, and selection pressure redirected to different traits. Based on surveys of cattle producers, I am highly suspicious that the majority of cattle producers are using EPDs at all, and if they are using them, if they are using them appropriately. A BEEF Magazine survey indicated that the top criteria to select bulls is actual birth weight- this is not using EPDs or using them correctly. Those producers who embrace technology, whether new or old tech, will be the heroes who lead the beef industry forward. Our experience at our Thompson Research Center has been much different than the data reported in the SPA, CHAPS, or Minnesota data. The Thompson Research Center is operated as a highly profitable commercial herd. Calves are not creep feed or otherwise pampered. In our data, from 1996 to 2013, weaning weight increased by 1.5 pounds per year. While this is not as rapid as the 2.6 or 2.1 pounds per year seen in the Angus data, it is much larger than zero. In our experience, if producers use AI sires and apply a consistent breeding objective then phenotypic improvement will be seen. Lastly, we agree that the environment may be limiting the performance of cattle. That is why we have designed a research project in which the ultimate deliverable will be region specific EPDs and indexes that are tailored to specific environments.